Firefighters Park Troy review, pics, and info. 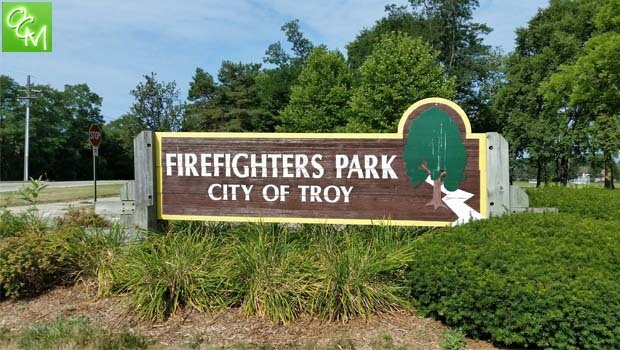 Firefighters park is a 96 acre park operated and controlled by the City of Troy and their parks and recreation department. Firefighters Park is Troy’s largest community park and is similar in size as Boulan Park (off of Crooks Rd) and similar in features as well. Firefighters Park is a scenic place that offers a great deal in the way of sports. However, many of the parks fields and features are beginning to show their age… especially in comparison to the more modern Boulan Park. Firefighters has numerous soccer fields that are well-maintained for Parks and Rec and soccer tournaments, but the football field and baseball diamond aren’t suitable for much more than simple recreation. Firefighters is the soccer park, Boulan is the baseball and tennis park. In addition to the sports, Firefighters Park has a great pavilion shelter to rent surrounded by tall trees and tons of picnic tables. East of the Pavilion is the Rouge River and a walking bridge. Very scenic but more of a flowing stream than a raging river. The Disc Golf Course is excellent and expansive. Half of it uses the park’s wide open spaces, the other half is very scenic and many of the holes utilize the dense forest. Smaller kids won’t have much to do in the park. The playground equipment is suitable but quite dated when compared to the play structures at other nearby parks. Firefighters Park Troy is a great park to visit, but the park is in need of some upgrades and TLC. Firfighters Park is open daily from 7a-10p. Dogs are allowed but must be leashed at all times. Shorefishing on the Rouge River is allowed.